This book is really an exercise in apologetics, and quite a good one at that. 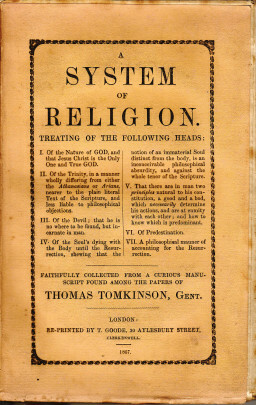 What is strange about the book is that it does not mention either Muggleton or Reeve, the reason possibly being reflected in the preface which proudly states concerning the books arguments that "The resurrection answers all the purposes of the Christian religion, and therefore makes this scheme perfectly orthodox." and the statement that "Now, who could have expected that these principles could be consistent with Christianity". This book maintains all the vital aspects of Muggletonianism while seeking acceptance of these views as being orthodox (in a protestant sense). The omission of any discussion of the commission of John Reeve is consistent with the belief that such knowledge was not necessary for salvation, merely for the assurance of salvation. "For hope not to have pardon by lessening of sin and saying "I am sorry for what I have done and it was not myself, but the temptation of the devil, who crept into my will and understanding and seduced me". For it is evident, there is no other Satan but man's own lust and pride;"